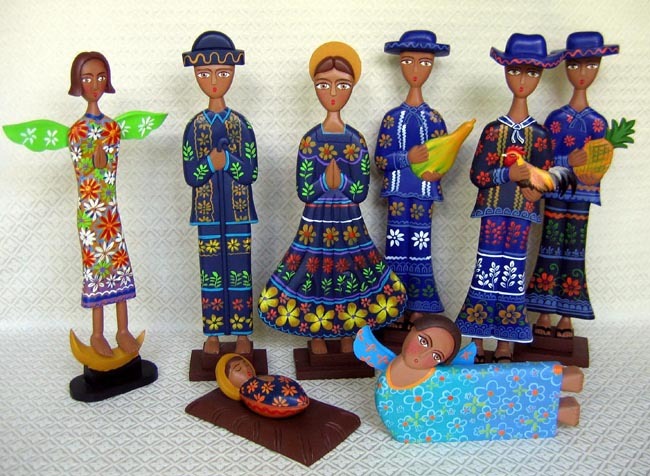 This Nativity set includes the Holy Family dressed in traditional Nicaraguan clothing. Mary’s Trencilla dress with colorful lines and full skirt originated with the mestizo or indigenous women. Nicaraguan women use the dress today in all types of marimba folk dances. Joseph wears a matching outfit with sombrero. Joseph stands 17 inches tall. The Holy Family is joined by two large angels. The female angel is standing barefoot on a moon, while the turquoise male angel is flying. The scene is completed by three Nicaraguan wise men dressed in traditional clothing and sombreros. They each bring a practical gift for Jesus: a large vegetable squash, a rooster, and a pineapple. The pieces are carved from cedar wood by the Jimenez Family: the mother, father, and many kids are involved in the process. The family lives in Masaya, a town close to Managua, the capital of Nicaragua. Then other artisans in Managua brightly paint the pieces. All of the figures are painted in unique floral designs, making each set one-of-a-kind.